Teen Depression & Suicide - It's Real! Teen Depression & Suicide – It’s Real! It’s another day and another phone call when I hear of another teen suicide. This time it’s a popular senior and the incoming student council president of an elite private school in Hobe Sound, Florida. The administration just wanted to ask general questions hearing that I deal with this quite often. School hasn’t started, but the teachers, staff members, and the community is quite shaken. As you can imagine, parents want answers to the many questions that they’ve never had to ask – Until now! Three weeks later, on the second day of school, I visited the campus to welcome the students, bring closure to a tough three weeks, and to encourage the students to make this a great year. That night in the gymnasium over 200 parents came out to hear me talk about Teens, Depression, and Suicide. 200 parents came from a school with only 175 student grades. 200 parents is a great turnout. The reality is sometimes there are no answers. There doesn’t have to be a note left behind or friends having concerns. It could be many reasons leaving us to speculate for the rest of our lives and to wonder what we could have done to prevent this suicide from happening. It could be an attempt to reach out for help that went too far and ultimately a suicide was completed. It could be irresponsible thoughts leading to irresponsible behavior where a teen is reacting in the moment and not thinking long term. For many teens, the smallest thing can happen and for them it’s the end of the world. In my opinion, I find that we’ve become an educational society focused greatly on academics and standardized testing. This has taken away human interaction and quality time where teens can learn problem solving and coping skills. Also, there is less activity that teens are involved in such as school sports and extracurricular activities, which leads teens to an average of 50-70 hours a week of screen time – computer, cell, social media outlets, etc. This is my opinion on the forefront. There are many other reasons such as mental illness – which is the case for over 90% of completed suicides. Want a Suicide Prevention Training Class with your staff or community? Visit Jeff Yalden at www.JeffYalden.com/suicide-prevention-training and let’s prevent these suicides from happening in our communities. Between the ages of 8-18 – Kids feel sad if they compare their lives to what they see on other social media profiles such as instagram, facebook, snap chat, group texting, etc. What does this lead to? It leads to isolation, feelings of comparison as they see they’re not as popular or accepted as others. It ultimately can lead to depression. Teenagers live in the here and the now and what they are seeing is posts and pictures of others having fun and they are not. They see smiles and laughs and they’re wondering why they aren’t having as much fun or laughing as much. Or, they wonder why they weren’t invited. This leads to so many thoughts going on in their heads. Again, leading to depression. In 2012, Medical News Today reported on a study suggesting that Facebook use may feed anxiety and increase a person’s feeling of inadequacy. For teenagers today, Facebook isn’t cool anymore. It’s instagram and snapchat right now that are the hottest. Same anxiety and an increase in a person’s feeling of inadequacy though. Just a different platform. A more recent study, led by social psychiatrist Ethan Cross of the University of Michigan, found that using Facebook may even make us miserable. Again, different social media platforms, but same results. Ask any teenager about the loss of their cell phone and at least half of them would tell you their social life would end or be worsened. Most teens will tell you that their mobile device improves their life and they couldn’t imagine a life without it. A majority of teens view their cell phone as the key to their social life. Second only to clothing, teens say, a person’s cell phone tells the most about their social status or popularity, outranking jewelry, watches and shoes. Teens say texting has advantages over talking because it offers more options, including multitasking, speed, the option to avoid verbal communication, and because it is fun. Teens can text blindfolded – can you? We as a society of parents having never been “on” all the time and connected have to understand that we are raising kids that are living at a time where they are constantly ‘on’ and connected. I would encourage any parent to explore ways to encourage or even mandate ‘off’ time, not just away from social media sites, but away from all devices. That is probably good advice for all of us. Our youth today live 24 hours with their cell phones by their side. They sleep with their cell phone at their head because they don’t want to miss something. The excuse I hear from parents is that their kids use their cell phone as an alarm clock. I understand, but that is an excuse. In the middle of the night they wake up and look at their phone. This is taking them out of that deep level four sleep. Now they want to check for texts, messages, instagram, snapchat, or any other social media outlets they are on. This is leading to losing sleep and being tired because they’re not getting the adequate sleep they need; and we want to make the school day start later? Let’s address the problem and not enable the situation. Let’s not even address nutrition and physical activity that is depriving today’s youth as well. Take the phones away at bedtime and get them a cheap $15 alarm clock that shows time. The age of teens 13 – 19 is an unsettling time, with the many physical, emotional, psychological and social changes that accompany this stage of life. This is where you need to watch out for teen depression. Ups and downs are a regular part of life. However, sometimes “down” periods last longer than usual. This is usually a result of chemicals in the brain, called neurotransmitters, being out of balance. Among teens, depression can be a very real problem. Experts estimate that teen depression strikes about one out of eight teenagers. Teen depression can come on as a result of chemical changes in the brain due to stress or even hormonal changes. No matter how teenage depression occurs it’s important to get help restoring the brain’s chemical balance, as prolonged depression can lead to self-destructive behaviors including risk taking, cutting, self-harm, substance abuse and even suicide. While these symptoms can be experienced by nearly everyone at some point in life, it is important to be able to tell teen depression apart from the normal roller coaster of life. A general rule of thumb for recognizing teenage depression is that five or more symptoms will persist without break for more than two weeks. Major depression: This type of teen depression is of short duration, although it is quite severe. It is possible to have a bout of severe depression, feel fine for a few months (or even years), and then have another bout. For teens, though, even one bout of severe depression can feel as though it will never end and prompt a suicide attempt. Dysthymia: Dysthymia lasts much longer than major depression, and the feelings are not as severe. Some teens have this low level depression that plagues them for years without having it diagnosed. This type of depression can also lead to teen suicide if the teenager becomes discouraged with never feeling happy. Another type of teen depression has to do with life changes. It is called adjustment disorder with depressed mood, and it can be the result of the death of a loved one, divorce, moving to a different town, or even changing schools. This, too, can lead to teen suicide if the teenager feels hopeless, and that the feeling will never end. Teen depression can be treated and (Suicide Prevention Training is available), before lasting damage is done in the form of self-medicating (through substance abuse) or even teen suicide. Every teenager is different, however. For some teens, therapy alone works well, while for others, medication is needed. Most teens respond favorably to a combination of therapy and medication. However, it is important to realize that medication can become habit forming, and that it should only be used while under a doctor’s care, and only as directed. Teen suicide is a very real issue today in the United States. As parents and educators we need not shy away from this subject. We are dealing with an epidemic and by talking about it we can help save a life or more. In order to prevent teen suicide, it is vital to recognize what leads to it, and then treat the causes. National Institute of Mental Health believes that as many as 25 suicides are attempted for each one that is completed. That means that for every teen suicide that you hear of, there are probably at least 25 suicide attempts made. And this does not even cover the teenage suicide attempts and completed suicides that are never heard about. Understanding that a teen suicide attempt is a call for help is essential in preventing a completed attempt later. Many attempts are calls for help and lead to living a fulfilling and meaningful life years later. Teenagers experience strong feelings of stress, confusion, self-doubt, pressure to succeed, financial uncertainty, being a burden, and other fears while growing up. For some teenagers, divorce, the formation of a new family with step-parents and step-siblings, or moving to a new community can be very unsettling and can intensify self-doubts. For some teens, suicide may appear to be a solution to their problems and stress. The reality is SUICIDE IS A PERMANENT ACTION TO A TEMPORARY PROBLEM! Many of the signs and symptoms of suicidal feelings are similar to those of depression. Teen suicide statistics draw a correlation between gender and suicide. It is interesting to note that there are some very clear indications that suicide is different for males and females, attempted and completed suicides alike. For example, males are four times more likely to die from suicide than females. However, teen girls are more likely than teen boys to attempt suicide. So, even though teenage girls make more attempts on their own lives than teenage boys, the boys are more likely to actually complete a suicide attempt. They do not allow for intervention, and are less likely to “call for help” through a suicide attempt, since there is often little opportunity to get males into treatment since their suicide completion rate is higher than that of females. There are several different factors that may lead a teenager to take his or her life, but the most common is depression. Feelings of hopelessness and anxiety, along with feelings of being trapped in a life that one can’t handle, are very real contributors to teen suicide. In some cases, teenagers believe that suicide is the only way to solve their problems. The pressures of life seem too much to cope with, and some teenagers look at suicide as a welcome escape. Counseling – This can be done individually or as a family. Techniques allow your teenager to learn to cope with life. Often, when a teen learns how to handle problems (and families learn how to help), the desire to kill him or herself dissipates. Residential treatment – This is treatment in which a suicidal teen goes elsewhere to live for a time. This can be a special treatment facility, or it can be a therapeutic boarding school. In these settings, the teenager is monitored 24/7 in order to prevent a suicide attempt. Additionally, most residential treatment facilities have trained professional staff that can help a suicidal teen. Medication – This is often seen as a last resort, or as something complementary to other treatments. It is important to note that in some teenagers, medication can have the opposite effect desired; some studies show that for some teens anti-depressants actually increase the chance of teen suicide. Carefully consider your teen’s needs before medicating. It is important to treat your child with respect and understanding. 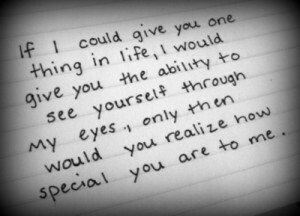 Show your unconditional love, and offer emotional support. It is important that a teen considering suicide feel loved and wanted. Show your teenager that it is possible to overcome life’s challenges, and make sure that he or she knows that you are willing to help out. 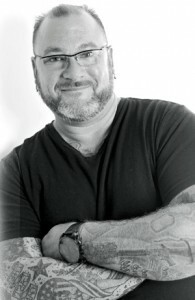 If you are interested in Suicide Prevention Training for Schools, Teachers, Community or Military Professionals, please visit www.JeffYalden.com/suicide-prevention-training and we will be glad to come out and train your staff members on how to identify, question, persuade, and refer a person they might suspect to be suicidal. Please read . . .
Jeff Yalden is a youth motivational speaker and facilitator of Suicide Prevention Trainings. Jeff has worked with youth, educators, and families for 23 years. He’s the author of Your Life Matters, a radio show host of The Jeff Yalden Show and has a Podcast – Encouraging Parents & Inspiring Teens. Since 1992, Jeff has traveled 50 states and 48 countries mesmerizing teen audiences with his heartfelt message about Love, Life, and Living. He’s delivered his talk in over 4,000 high schools and middle schools, colleges and universities. He’s been the keynote speaker for hundreds of leadership conferences talking to teens about personal leadership and your influence on others. Jeff Yalden is an advocate for mental health and teen depression. Being a person that has been diagnosed with depression and anxiety disorder, bi-polar type 2, and PTSD, Jeff is passionate about sharing his story and inspiring those in a position to help and inspire others. Jeff is engaging, charismatic, and real. Your community will be delighted to host Jeff for your teens and parents or a Staff In-Service Training on how to identify, question, persuade, and refer a potential suicidal student to get help. Your audience will laugh, think, and reflect, but ultimately they will leave cheering themselves and their kids on. For more information, visit www.JeffYalden.com. 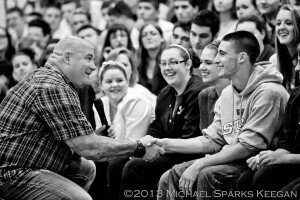 and www.JeffYalden.com/suicide-prevention-training.